Ecosystems often change in radical ways. Lakes, forests, rangelands, coral reefs and many other ecosystems are often transformed by such things as overfishing, insect pests, chemical changes in the environment, overgrazing and shifting climate. A vivid example of a collapsed resource is the Atlantic cod fishery. Once the most abundant and sought-after fish in the North Atlantic, cod stocks collapsed in the 1990s due to overfishing, causing widespread economic hardship in New England and Canada. Now, the ability to detect when an ecosystem is approaching the tipping point could help prevent such calamities. 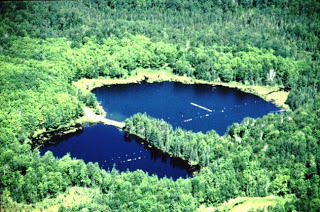 In the new study, the Wisconsin researchers, collaborating with groups from the Cary Institute for Ecosystem Studies in Millbrook, N.Y., the University of Virginia in Charlottesville, and St. Norbert College in De Pere, Wis., focused their attention on Peter and Paul lakes, two isolated and undeveloped lakes in northern Wisconsin. Peter is a six-acre lake whose biota were manipulated for the study and nearby Paul served as a control. The group led by Carpenter experimentally manipulated Peter Lake during a three-year period by gradually adding predatory largemouth bass to the lake, which was previously dominated by small fish that consumed water fleas, a type of zooplankton. The purpose, Carpenter notes, was to destabilize the lake's food web to the point where it would become an ecosystem dominated by large predators. In the process, the researchers expected to see a relatively rapid cascading change in the lake's biological community, one that would affect all of its plants and animals in significant ways. "We started adding these big ferocious fish and almost immediately this instills fear in the other fish," Carpenter explains. "The small fish begin to sense there is trouble and they stop going into the open water and instead hang around the shore and structure, things like sunken logs. They become risk averse." The biological upshot, according to the Wisconsin lake expert, is that the lake became "water flea heaven." The system becomes one where the phytoplankton, the preferred food of the lake's water fleas, becomes highly variable. "The phytoplankton get hammered and at some point the system snaps into a new mode," says Carpenter. Throughout the lake's three-year manipulation, all its chemical, biological and physical vital signs were continuously monitored to track even the smallest changes that would announce what ecologists call a "regime shift," where an ecosystem undergoes radical and rapid change from one type to another. It was in these massive sets of data that Carpenter and his colleagues were able to detect the signals of the ecosystem's impending collapse. Ecologists first discovered the signals in computer simulations of spruce budworm outbreaks. Every few decades the insect's populations explode, causing widespread deforestation in boreal forests in Canada. Computer models of a virtual outbreak, however, seemed to undergo odd blips just before an outbreak. The problem was solved by William "Buz" Brock, a UW-Madison professor of economics who for decades has worked on the mathematical connections of economics and ecology. Brock used a branch of applied mathematics known as bifurcation theory to show that the odd behavior was in fact an early warning of catastrophic change. In short, he devised a way to sense the transformation of an ecosystem by detecting subtle changes in the system's natural patterns of variability. The upshot of the Peter Lake field experiment, says Carpenter, is a validated statistical early warning system for ecosystem collapse. The catch, however, is that for the early warning system to work, intense and continuous monitoring of an ecosystem's chemistry, physical properties and biota are required. Such an approach may not be practical for every threatened ecosystem, says Carpenter, but he also cites the price of doing nothing: "These regime shifts tend to be hard to reverse. It is like a runaway train once it gets going and the costs -- both ecological and economic -- are high." In addition to Carpenter and Brock, authors of the new Science report include Jonathan Cole of the Cary Institute of Ecosystem Studies; Michael Pace, James Coloso and David Seekell of the University of Virginia at Charlottesville; James Hodgson of St. Norbert College; and Ryan Batt, Tim Cline, James Kitchell, Laura Smith and Brian Weidel of UW-Madison.